FIRST SECURITY SWEET ON YOU FEB 14TH 2019 & 2019 events! SPONSORED BY FIRST SECURITY BANK GOLD CLUB. 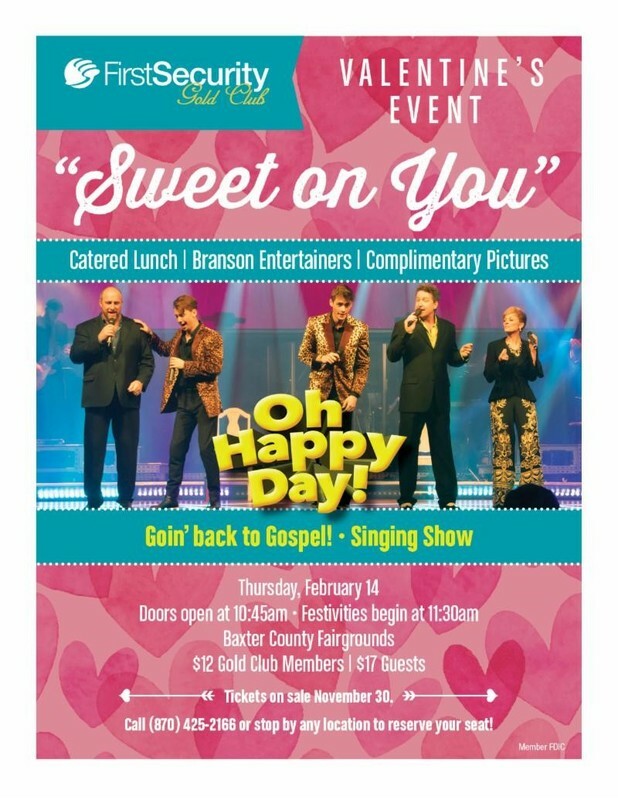 VALENTINE'S EVENT "SWEET ON YOU"
Call (870) 425-2166 or stop by any location to reserve your seat! Limited space available. Call 870 425-2166 to reserve your spot. Join us for a fabulous one-day trip to Springfield, Missouri, to visit the Wonders of Wildlife National Museum & Aquarium. This world-class facility consists of a 1.5 million-gallon aquarium adventure showcasing 35,000 live fish, mammals, reptiles and birds, and an amazing wildlife museum that brings visitors eye-to-eye with the greatest collection of record-setting game animals ever. You don’t want to miss this spectacular destination put together by Johnny Morris, founder/CEO of Bass Pro Shops! cover things like zoom, lighting, perspective and the Rule of Thirds. Come ready to learn and don’t forget your smartphone! Join us on this incredible five-night, six-day tour of Central Texas with some of the best highlights that Dallas, Waco, San Antonio and Fredericksburg have to offer during the beautiful bluebonnet blooming season. Highlights include: JFK Observator, Love & War in Texas Restaurant, San Antonio River Walk, The Alamo, Mission San José, San Fernando Cathedral, Texas Hill Country – Fredericksburg Vineyard, Lyndon B. Johnson Ranch, Texas Cowboy Hall of Fame, Billy Bob’s, Southfork Ranch (TV series “Dallas”), Magnolia Market Silos (Chip & Joanna Gaines), Much more! and Latin Dance steps with Amanda Kasinger, former Arthur Murray School of Dance instructor. So you think you can dance? Definitely! From New York’s Finger Lakes region to Niagara Falls, Ontario, what a spectacular tour we have planned for you! Beautiful scenery, colorful gardens, historic properties, exciting adventures and delicious dining will fill your days. We’ll cruise the international waters of the St. Lawrence River around 1000 Islands in Alexandria Bay, visit Boldt and Belhurst Castles. Our guided tour of the Finger Lakes region will highlight history, New York’s agricultural bounty and local creations. At Rochester’s Highland Park, see more than 500 varieties of lilac bushes, from the deepest purple to the purest white, from lightly scented to irresistibly aromatic. Then it’s on to Niagara Falls for exploration and sensational excursions. Our hotel is located in the heart of the resort area within an easy walk to the entertainment district and Niagara Falls, one of Earth’s natural wonders. Enjoy the lovely village of Niagara-on-the-Lake, described as the prettiest town in Canada. Take an exhilarating boat ride so close to the falls that you’ll feel the power of the rushing water! Join us for this extraordinary trip! Get caught up in the laid-back Italian lifestyle! It would be hard to leave Italy feeling stressed. Along the glimmering shores of Lake Como and the beautiful cobblestone streets of Florence, leisure and relaxation remain mainstays of the Italian lifestyle. Explore the home of Italy’s former royal family, the House of Savoy. Soak up the sun on the Italian Riviera. Escape to the picturesque villages of Cinque Terre. Just unwind and let the Italians teach you a thing or two about indulgence (trust us, they know best)! This tour has been customized for First Security Gold Club and is one you won’t want to miss! Dive into the culture and eastside beauty of the Canadian Maritimes! Enjoy rural scenery and rugged coastal landscapes as you journey off the beaten path to discover one of Canada’s most storied regions. Uncover immigrant history, fascinating Acadian culture and the tranquil lifestyle of quaint fishing villages as you get to know Nova Scotia, New Brunswick and Prince Edward Island. Picturesque sea views, small-town charm and a colorful past collide on this breathtaking trip. Travel with us to New England during its most beautiful time of the year! Enjoy the spectacular colors of autumn as we make our way from the Berkshire Mountains of Massachusetts, the Green Mountains of Vermont and the White Mountains of New Hampshire to the rugged coast of Maine. You won’t want to miss this fabulous trip that includes all the best of New England in the fall! School of Dance instructor. You’ll be dancing like the Stars in no time! Join us on an exciting trip to The Big Apple at its most festive time of year! Spend four nights at the lovely Millennium Broadway, see two Broadway shows and get into the holiday spirit at Radio City Music Hall’s annual Christmas Spectacular featuring the high-kicking precision of the world-famous Rockettes! Marvel at the elaborately decorated Christmas windows at Bergorfs, Tiffany’s, Saks Fifth Avenue, Macy’s, Bloomingdales and more. Do some holiday shopping at the extraordinary Bryant Park Christmas Market. Stroll through Rockefeller Plaza to see the illuminated Christmas tree and other holiday decorations. Visit the poignant 9/11 Memorial and Museum that serves as both a tribute to the past and a place of hope for the future. You’re sure to take home treasured memories of this wonderful trip to fabulous New York City!